Unforeseen fact changes: For example: an employee assigned to a shift calls in sick, an airplane scheduled to take off has a technical delay, one of the machines or vehicles break down, ... Use backup planning. Unknown long term future facts: For example: The hospital admissions for the next 2 weeks are reliable, but those for week 3 and 4 are less reliable and for week 5 and beyond are not worth planning yet. Use continuous planning. 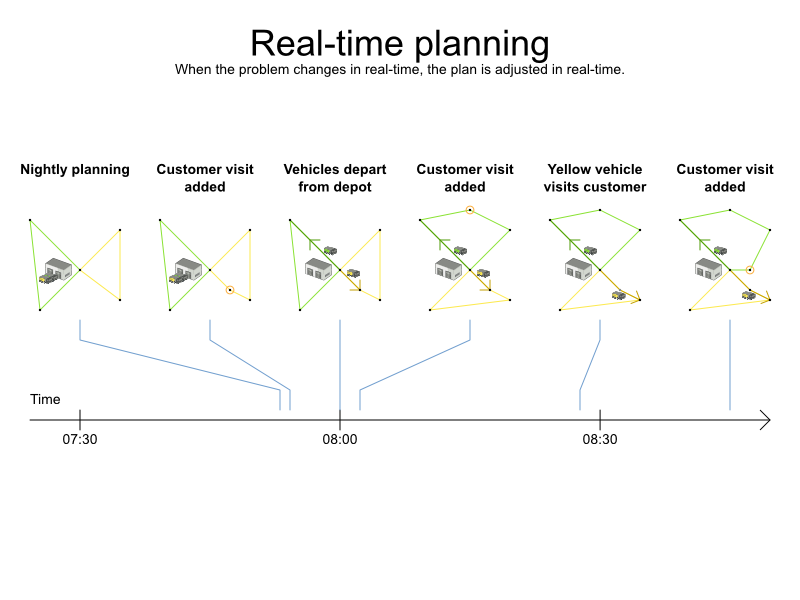 Constantly changing planning facts: Use real-time planning. Waiting to start planning - to lower the risk of planning facts changing - usually isn't a good way to deal with that. More CPU time means a better planning solution. An incomplete plan is better than no plan. Luckily, the optimization algorithms support planning a solution that's already (partially) planned, known as repeated planning. Then, when things go wrong (one of the employees calls in sick), change the planning facts on the original solution (delete the sick employee leave his/her shifts unassigned) and just restart the planning, starting from that solution, which has a different score now. The construction heuristics will fill in the newly created gaps (probably with the spare employee) and the metaheuristics will even improve it further. Continuous planning is the technique of planning one or more upcoming planning windows at the same time and repeating that process monthly, weekly, daily or hourly. Because time is infinite, there are infinite future windows, so planning all future windows is impossible. Instead, plan only a fixed number of upcoming planning windows. Past planning windows are immutable. 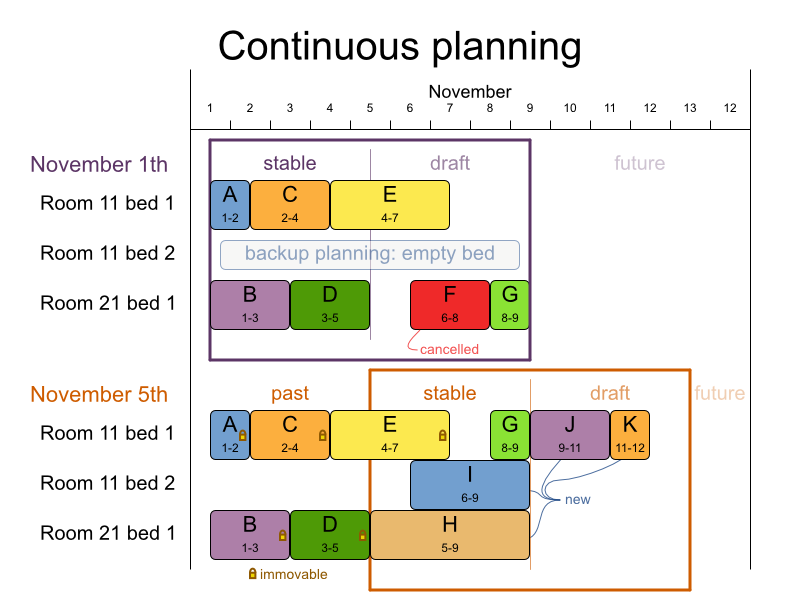 The first upcoming planning window is considered stable (unlikely to change), while later upcoming planning windows are considered draft (likely to change during the next planning effort). Distant future planning windows are not planned at all. Past planning windows have only immovable planning entities: the planning entities can no longer be changed (they are unable to move), but some of them are still needed in the score calculation, as they might affect some of the score constraints that apply on the upcoming planning entities. For example: when an employee should not work more than 5 days in a row, he shouldn't work today and tomorrow if he worked the past 4 days already. Notice the difference between the original planning of November 1th and the new planning of November 5th: some planning facts (F, H, I, J, K) changed, which results in unrelated planning entities (G) changing too. To make some planning entities immovable, simply add an entity SelectionFilter that returns true if an entity is movable and false if it is immovable. Custom MoveListFactory and MoveIteratorFactory implementations must make sure that they don't move immovable entities. To do real-time planning, first combine backup planning and continuous planning with short planning windows to lower the burden of real-time planning. While the Solver is solving, an outside event might want to change one of the problem facts, for example an airplane is delayed and needs the runway at a later time. Do not change the problem fact instances used by the Solver while it is solving, as that will corrupt it. Instead, add a ProblemFactChange to the Solver which it will execute in the solver thread as soon as possible. Any change on the problem facts or planning entities in a ProblemFactChange must be done on the instances of the Solution of scoreDirector.getWorkingSolution(). Note that these are not the same entity instances as in the bestSolution (or therefore your user interface): they are clones. Any change on the problem facts or planning entities in a ProblemFactChange must be told to the ScoreDirector. Many types of changes can leave a planning entity uninitialized, resulting in a partially initialized solution. That's fine, as long as the first solver phase can handle it. All construction heuristics solver phases can handle that, so it's recommended to configure such a SolverPhase as the first phase. In essence, the Solver will stop, run the ProblemFactChange and restart. Each SolverPhase will run again. Each configured Termination (except terminateEarly) will reset. This means the construction heuristic will run again, but because little or no planning variables will be uninitialized (unless you have a nullable planning variable), this won't take long. Normally, you won't configure any Termination, just call Solver.terminateEarly() when the results are needed. Alternatively, you can subscribe to the BestSolutionChangedEvent. A BestSolutionChangedEvent doesn't guarantee that every ProblemFactChange has been processed already, so check Solver.isEveryProblemFactChangeProcessed() and ignore any BestSolutionChangedEvent fired while that method returns false.